GeoCrede is a web-delivered, geo-visual (map) analytical platform on India’s banking data. It helps you to sift through maze of data to identify the geographies with opportunities in general and among the growing markets. The data-driven platform is based on the quarterly data releases on deposits & credit, at districts & towns, released by the official agencies. The authentic & comprehensive data released on the banking sector’s – mobilisation of deposits & disbursal of credit facilitates informed decision-making in Banks & NBFCs as well as in conducting research. Visualise & analyse the current market size & growth of deposits & credit at micro geographies – district & centres. Build product-wise business targets & strategies by understanding the trends in size of deposit or automobile loans, across districts/centres & the growth in these micro-markets. Identify regions & towns that can be focussed for market expansion in terms of more branch network or opportunities for new products in the micro-markets. New markets can be explored after thoroughly understanding the existing dynamics of of deposits & credit in the markets & build informed Go-to-market strategies in new regions/centres. An analytical double-map presentation of market share & growth in deposits or type of loan to understand the competition & growth potential with precision. 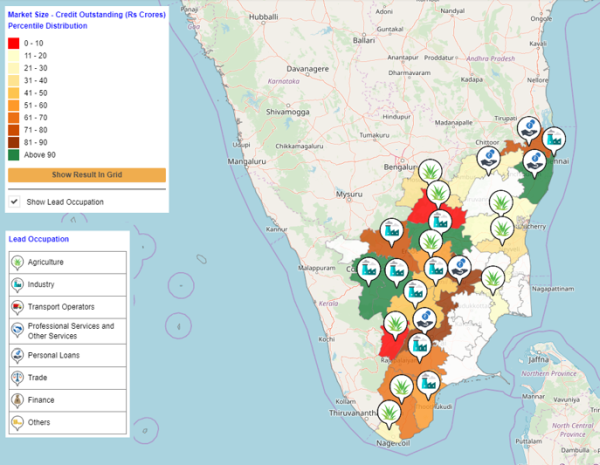 A classic twin map view facilitates understanding the regions/centres with intense competition & the up-side growth potential with precision to make informed decisions on resources allocation & expansion in regions/centres. Quick, ready-to-use analytical tabulations on market size, growth & market share. A ready-reckoner for management to get a quick-view of the deposit & credit markets. GeoCrede, as a platform is an integrated repository of data, maps and query-modules to criss-cross the Indian banking data. GeoCrede’s analytic capabilities seeks to help bankers understand trends and progress of credit-offtake and deposit mobilisation to the utmost level of granularity: centre-level data. GeoCrede’s USP is to integrate bank’s proprietary data to provide a holistic picture of the banking sector. With the aid of color-coded maps, bankers can understand laggards or torch-bearers of the business and make strategic decisions. The Indian banking sector is seeing a unique period of growth driven primarily by technology and the motive of financial inclusion. NBFCs can use GeoCrede to understand micro-geographies – down to the banking-centre level and make targeted decisions on positioning and product-mix. NBFCs can use occupation-level data as a leading indicator to channelize in addition to analysing performance of Small Finance Banks, thereby strengthening their market strategy. GeoCrede is armed with a time-series database on the Indian banking sector from 2012-13 till latest quarterly release as per the Reserve Bank of India. This series of quarterly data is useful to understand seasonality, fluctuations along with trends and progress in financial inclusion. The map-based analytics provides researchers a visual representation and spatial distribution of parameters pertaining to banking. The provision of centre-level data seeks to present a very granular level of banking data to understand financial inclusion. Copyright @ Akara Research & Technologies Pvt Ltd.